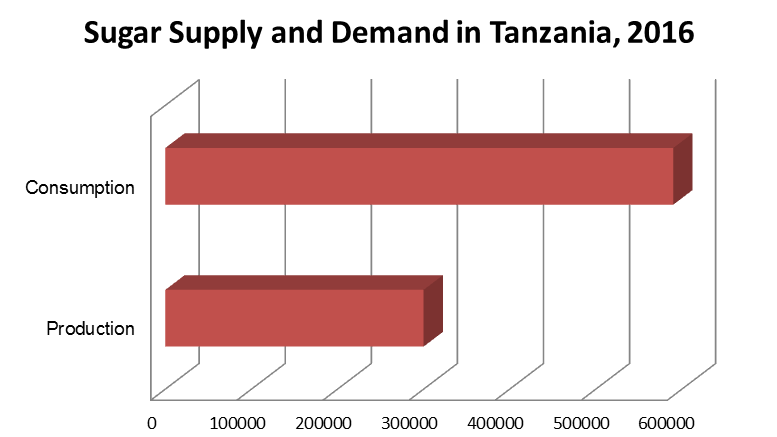 Currently (2016), Tanzania produces an average of 300,000t of sugar per year with a demand of 590,000t per year, of which 420,000t for direct domestic consumption and the remaining 170,000t for industrial use. The sugar industry in Tanzania provides direct employment to about 30,000 people. Sugar production is concentrated mainly in 3 regions: Morogoro, Kagera, and Kilimanjaro. At present, there are 4 large sugar estates in Tanzania: the Kilombero Sugar Company with 40% market share, the Tanganyika Planting Company (34%), Kagera Sugar (17%), and Mtibwa Sugar Estates (9%). Currently (2016), Swedish agro-industrial development company Agro EcoEnergy is in the final stages of obtaining a land lease to produce 120,000t of sugar near Bagamoyo. To address the current supply gap in sugar production, the Government of Tanzania is looking to develop an additional 3 to 5 large-scale sugar projects. Tanzania’s President Magufuli recently announced that the country has suitable land for sugar plantations, including 10,000 hectare area in Bagamoyo, 75 kilometers (47 miles) north of Dar-es-Salaam on the coast of the Indian Ocean. During a recent meeting with Jorge Lopez Tormo, Cuban Ambassador to Tanzania, Magufuli said that he will immediately offer land to prospective investors in sugarcane production. Earlier in 2016, Prime Minister of Tanzania, Kassim Majaliwa, said that more sugar plants will be established in the next 4 years across the country to meet the growing demand for sugar. He noted that the strategic areas where sugar plants will be established include: Rufiji Valley, Kigoma, Kilosa, Ngerengere, and Bagamoyo. According to a recent study by the European Commission, Tanzania’s regulatory framework for domestic sugar production is sound and up to date. Tanzania and Cuba commit to strengthening bilateral relations with focus on economic benefits and mutual cooperation. Tanzania has committed to facilitating investors from Cuba in sugar production and medical drugs.